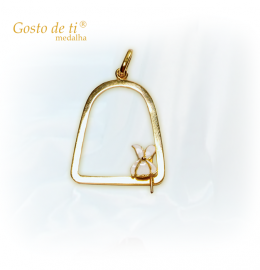 This item is sold by LUGAR DOS AFETOS - Fundação Graça Gonçalves. Jóia fabricada em ouro com 1 diamante de 0,005Kl. Without shipping costs to your country. Support this cause, or others, by selling your items Learn how to help. Be the first to comment this item. A Fundação desenvolve a sua atividade no respeito pela Declaração Universal dos Direitos do Homem e pelos princípios de defesa da vida humana, da liberdade, tendo em vista a Educação pelos (e para) os Afetos de crianças, adultos e idosos. Buying this item, you are supporting LUGAR DOS AFETOS - Fundação Graça Gonçalves. Please, choose a payment method. To be able to purchase this item you must turn on the notifications so you can receive the confirmation email and the payment information. When you make a purchase or win an auction the seller will receive your address so that he can send you the product. There are no shipment costs to your country. If your country is not United States of America, Click here. This item will be sent from Aveiro, Portugal. International shipping can have extra costs. You are responsible for setting up the shipping costs. Please, be aware that you did not set up shipping costs to United States of America. Are you sure about removing the item ? Export your store by pasting this code to your charity’s website. Copie e cole o código abaixo no seu website ou adicione um separador à sua página de fãs do Facebook com os seus leilões solidários. Your account is not valid yet! Please check your email to confirm your account. eSolidar does not support this browser properly. Your account has not been validated by the team of eSolidar. Your profile was not validated by eSolidar team yet. To use this feature, you must confirm your email. If you haven’t received it please Click here. Are you related to a charity or know any that you would like to see on eSolidar?